It was the middle of the night when the villagers sounded the alarm: a huge Sumatran elephant was raiding their rice fields, and they needed urgent help to drive it back to the forest. Dodot—a veteran Indonesian elephant keeper trained to handle such emergencies—rushed to the scene, fearing villagers would take matters into their own hands if he didn't get there in time. "It was the king," Dodot said of the hungry bull male that had strayed from the forest in southeast Sumatra in search of food. "He's not afraid of humans, or weapons. He owns the territory." It was the third such intrusion in a month. Confrontations between elephants and humans can quickly turn violent in Sumatra, where competition for space has intensified as the island's forests have been rapidly cleared for timber and farming. 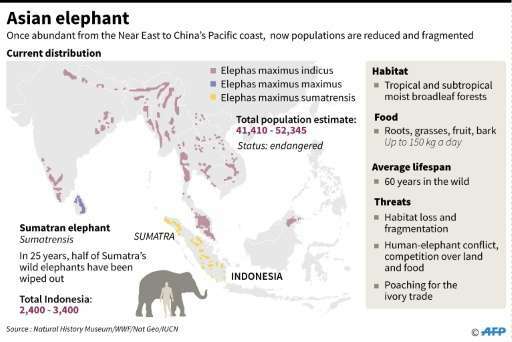 Nearly 70 percent of the Sumatran elephants habitat has been destroyed in a single generation, says conservation group WWF, driving them into ever-closer contact with humans. Villagers have been trampled and killed by stampeding herds, but it's the elephants that have suffered most as their habitats have shrunk. In 25 years, half of Sumatra's wild elephants have been wiped out. The species was upgraded to critically endangered in 2012, with experts blaming the twin drivers of deforestation and conflict with humans. Ivory poachers have long hunted bulls for their tusks but many elephants are killed simply for trespassing on land. This month an elephant was found dead near a palm oil plantation in the island's northeast. Authorities believe it accidentally ingested fertiliser but an investigation is continuing, the local conservation head told AFP. Keeping the peace between elephants and humans is a round-the-clock job for rangers like Dodot, who like many Indonesians goes by just one name. He's assigned to one of three specialist elephant response units strategically located at hotspots around Way Kambas National Park, where human settlements border a tranche of lowland forest home to an estimated 250 wild Sumatran elephants. At the Margahayu station half a dozen rangers man their remote forest camp year round, rotating four days on, two days off. They cook their own food, maintain canals and fences and, most importantly, patrol the borders with a squad of six captive elephants under their command. These elephants are vital to the team's success. Atop patrol elephants, rangers can keep track of the wild, nomadic herds as they roam the 1,300 square kilometres of dense forest. The patrol elephants—trained by the keepers, or mahouts, who live alongside them—are skilled at picking up the trail of their wild kin, said Eko Arianto, a forest policeman posted with the Margahayu response unit. 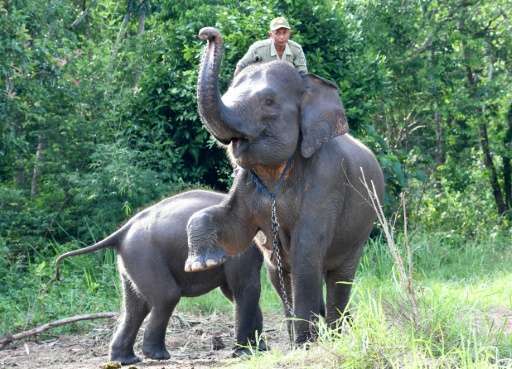 "When we spot wild elephants we inform the community, and our teams on the outside, to be on the lookout," he told AFP. "That way they can be ready to turn them back." It doesn't always go to plan. Villagers killed an elephant in 2012, Arianto said, while angry farmers have been known to use fire, poison and beehives to drive away intruders. Dominant males are solitary and harder for the rangers to track, emerging suddenly from the forest to raid fields before "vanishing" for weeks on end, Arianto said. A single incident can strain hard-earned trust between rangers and local communities, who view elephants as a threat to their livelihoods and blame park authorities when they run amok. The response units recruit locals to thaw suspicion and foster a sense of joint responsibility for the future of the iconic species. "We are striving to find ways people can coexist with the elephants," Arianto said. "If the community feels involved, then they will help protect them. These elephants not only belong to us, but to everyone." Their diplomacy has paid off. Rangers estimate the frequency of clashes has dropped up to 80 percent since they began patrolling the area in 2015. Farmers—once so fearful of rampaging elephants they slept in their fields at night—were now reporting their first undisturbed harvests in years, Dodot said. "Before we were here they were constantly on guard. Now they stay at home to sleep," he told AFP. The patrols also locate and disable traps laid by poachers, disrupting lucrative criminal networks trading in exotic species. It's a dangerous business. Last year, a beloved patrol elephant from a separate Sumatran unit was found dead at his station, his tusks hacked off. But those on the frontline aren't deterred. There's plans to expand patrols next year to a fourth outpost at a trouble-prone section of Way Kambas, Arianto said, and talk of acquiring a drone for aerial tracking. Junaidi, a 23-year-old trainee ranger, uses GPS technology to map the position of wild herds, but in the jungle relies on traditional skills passed down by experienced mahouts. Following dung trails and crushed vegetation, the young recruit wanders deeper into the forest until spotting three elephants, almost camouflaged in the undergrowth, grazing silently. "If the next generation doesn't care for them, what does their future hold?" Junaidi said.